After your doctor has scheduled your surgery, call the Pre-Admission Screening Services (PASS) Unit at 202-715-4557 (from 8 a.m. - 4:30 p.m., Monday through Friday) to schedule an in-person appointment to speak with a registered nurse. The nurse will gather your medical history and provide instructions about any necessary medical testing and dietary restrictions (generally no eating, drinking, gum, mints or candy from midnight prior to the day of surgery) at the appointment. Please bring a list of your current medications as well as the names and phone numbers of your primary physician and specialists you see. The Concierge in the Main Lobby at the 23rd Street entrance to GW Hospital can direct you to the PASS Unit. To preregister for surgery, call the Admissions Office at 202-715-4907. Be ready to provide your name, address, next-of-kin and insurance information. Please call your insurance company to see if there are any approvals needed before admission to the hospital. This will ensure maximum use of your health insurance benefits for your hospital stay and services. For some surgical procedures, your physician may recommend Autologous Blood Donation. This means you donate your own blood for potential use during your surgical procedure, should the need arise. The surgeon might also prescribe Directed Donor Blood Donation. This means that another person donates their blood for potential use during your surgical procedure should the need arise. Of course, the blood types must match. For either autologous or directed blood donation, you must first call the GW Hospital Transfusion Services Department at 202-715-4398. They will assist you in choosing a blood collection facility convenient to you. Please allow five days for the donated blood to be processed and sent to GW Hospital. On the day of surgery, please arrive at least one hour and 15 minutes before your scheduled procedure or earlier if your surgeon has indicated. Everyone who enters the hospital is required to show photo ID. If you have not preregistered, please check-in with the concierge in the Main Lobby who will direct you to the Admissions Office. Should you need wheelchair assistance, please stop by Concierge Services, located in the Main Lobby. On the day of your surgery, the Concierge in the lobby will direct you to the first floor where you will check-in. You will be asked to sign required hospital documents and provide the name of the responsible adult taking you home if you are leaving on the same day of your surgery. We will not let you take a taxi home without a responsible adult to accompany you. A staff member will help you change into a hospital gown, robe and slippers. Do not wear your contact lenses, but you may wear your glasses. If you wear dentures, we may need to remove them before surgery. If you wear a hearing aid, you may do so throughout surgery, in most cases. Please leave your jewelry and valuables at home as GW Hospital will not be responsible for loss or theft of personal belongings. The person(s) accompanying you should wait in the Surgical Reception Area. Because space is limited, please limit the number of visitors in this area and no children, if possible. The person accompanying you should sign-in so your physician and staff members can provide him/her with updates on your progress. From the Surgical Reception Area, you will be escorted to the Operating Room or the Pre-Op Room where you will be interviewed by an operating room nurse. An intravenous line will be placed in your vein to provide fluids. You will have an opportunity to see your surgeon and anesthesiologist before your surgery begins. You will be interviewed and may be examined by the surgical team. Often, these questions may have been asked before. Please be patient with our process as we work together to ensure the safest and most thorough surgical course for you. A registered nurse will stay with you for your entire surgical procedure. In the Operating Room, the staff will make you comfortable on the table. You will notice lights over your head and staff dressed in scrubs, hats, and masks. Please remember: If you are scheduled for outpatient surgery and undergo general anesthesia or sedation of any kind, you must be accompanied home by a responsible adult. Following surgery, you will be taken to the Post Anesthesia Care Unit (PACU). You will be monitored until the major effects of anesthesia wear off. Patients require privacy and attention in the PACU, so visitors are not permitted. They may see you as soon as you are settled in your hospital room or prepared for discharge if scheduled for the same day. If you are scheduled to be discharged the same day of your operation, you can expect to stay in the Outpatient Recovery Area for at least one hour or longer depending on your needs. You will receive written and verbal discharge instructions, prescriptions if prescribed, a beverage and assistance to the lobby. The Main Recovery Area is for patients who will be staying in the Hospital. A nurse will monitor your recovery. After evaluation by an anesthesiologist, you will be transferred to your hospital bed. Your visitors may join you there. 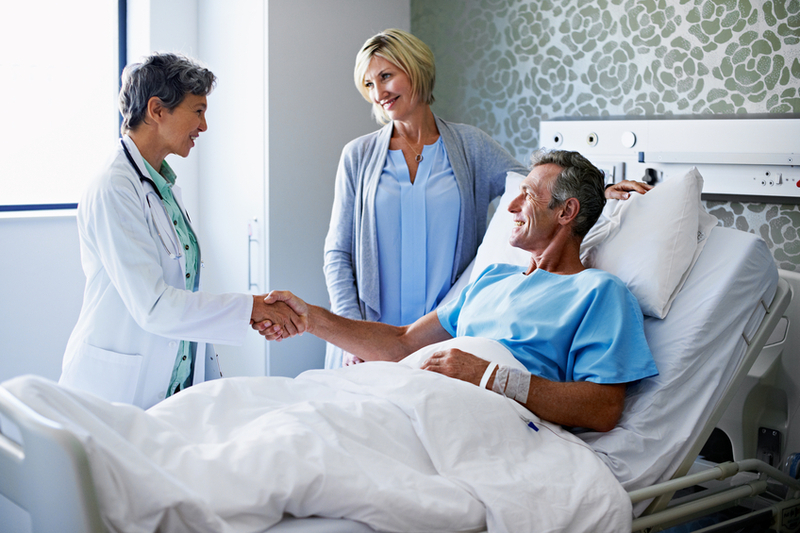 A Registered Nurse will oversee your nursing care needs during your hospital stay.